Hello all! In light of the NC Mall’s 9th anniversary, I am here today to interview the Space Faerie, who has very kindly agreed to sit with me here today for an interview. It had been a while since the BD Chat had something to buzz about. The excitement of the New BD had long worn off. The Smuggler’s Cove had remained empty for years. 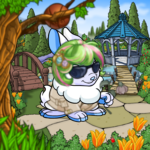 Fyora hadn’t added anything to her tower in a while. After 15 years of barely venturing outside the BD Chat, it was time to for me to see what else this site had to offer. Then along came a volleyball.